This book looks at one aspect of the Web 2.0 revolution: social networks, and describes how to succeed by using these social networks, and almost succeeds in its endeavor, given its scope and length. Its scope is neither too expansive nor overly ambitious. It does not aim to dissect web 2.0 startups, nor analyze the reasons behind web 2.0 successes as Flickr, YouTube, etc... And it certainly steers completely away from the technological underpinnings of web 2.0. Nor does it seek to pontificate or sermonize on strategizing in the world of Web 2.0 technologies as some books attempt to. This is a short book. 200 pages may seem more substantial than I suggest, but this is a book that can be read cover to cover in less than two hours, with time for a coffee break. The chapters are short, to the point of reading more like sound-bites than containing anything in-depth. Chapter 4, "The Strength of the Microcelebrity", for example clocks in at less than two thousand words, while Chapter 11, "Success Is Where You Find It", just over 2000 words. Think of the chapter lengths like a mass of microblog tweets making up each chapter, almost. But the anecdotes illustrating each chapter are interesting and pertinent. These anecdotes are what lend life to the chapters. And indeed, without these anecdotes much of the value of this book would be lost. Different aspects of social networks are covered in each chapter. Therefore, chapter 2 is a brief overview of different social networks out there, like hi5, orkut, linkedin, facebook, myspace, twitter, and bebo. 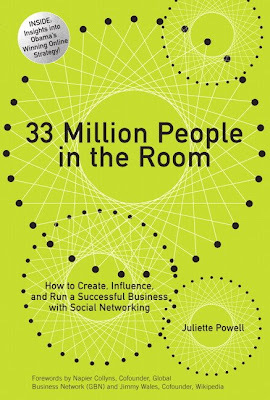 Chapter 3 takes two social networks, LinkedIn and Facebook, and talks the reader through using these two similar yet different networks, followed by an ending paragraph on privacy. "While LinkedIn is interested in what you worked on last year, Facebook is more interested in where you're going this afternoon. It focuses on ongoing activities, and the redesigned site puts actionable updates--such as renewing your status, posting a photo, or sharing a link--front and center on your profile." Common sense advice is proferred on the issue of privacy, and with the continual flaps over privacy, be it Facebook or Google or some other vendor, it is useful to note that Ch3 ends with this sage advice: "Just use common sense and remember that social networks are all about communicating, and, as with any method of communication, that means keeping some things private and making other things public. The real interest in social networking lies not in what you choose to hide but what you choose to display." Chapters 4, 5, and 6 essentially use examples of individuals to describe three aspects of social networks and how to succeed in using these networks: Johnny Chung Lee as a microcelebrity, Gary Vaynerchuk on the need for authenticity, and the (in)famous Sarah Lacy, with her very public fiasco with her interview of Facebook founder Zuckerbook, to highlight the need to take into account feedback loops that exist and how to recover, sort of, from very public humiliations as in Sarah Lacy's case, or to leverage upon your passion for something you believe in. Johnny Chung Lee is a truly remarkable example of a microcelebrity, who hacked the Wii remote, Wiimote, posted about it and other hacks on YouTube, attracted 10 million hits on his (YouTube) channel, and got invited to TED, where his talk rose to become one of the Top 10 TED talks online!! The author's advice on authenticity? "When looking to start your own blog, vlog, or Web site, pick a topic that you not only know about, but one that you truly care about as well. Personal passion is contagious, and users will appreciate and reflect your own excitement." So what about Sarah Lacy? "Sarah Lacy is the kind of reporter whose stories are featured on the cover of Businessweek. Knowledgeable, hard hitting, and direct, Sarah, Aka Valleygirl, was set to interview mark Zuckerberg, the 23-year-old founder and ceo of facebook and one of the subjects of her book Once You're Lucky, Twice You're Good: The Rebirth of Silicon Valley and the Rise of Web 2.0 "
"... when Mark Zuckerberg, 50 minutes into the one-hour interview and clearly irked by Lacy's unrelenting commentary and her revealing insider information, leaned over and said "I'm waiting for you to ask a question!," the audience responded with more than just a wave of laughter: They broadcast hundreds of complaints and snarky comments in real-time via mobile networking tool Twitter. Rallying behind Zuckerberg and encouraged by the camaraderie of their Twitter-based objections, the audience began to openly and unabashedly heckle Lacy." So is (momentary) incompetence bad? No. Far from it. "Despite the battering she had taken, that fateful—and painful—exchange boosted online pre-sales of Lacy's book that week by a factor of a thousand." Sarah Lacy's response? A (crass) rationalization that goes something like "...my annual income has more than tripled.... If the price to pay for that is getting mass attacked a few times a year, sadly, it's just the price."". Sadly, it seems like a classic case of confirmation bias (Wikipedia defines is as "confirmation bias is a tendency to search for or interpret new information in a way that confirms one's preconceptions and to avoid information and interpretations which contradict prior beliefs"). Someone should hand a copy of Mistakes Were Made (But Not by Me): Why We Justify Foolish Beliefs, Bad Decisions, and Hurtful Acts to Ms Lacy as a reading exercise. "The anecdotes in this book are really great, but pretty much everything else is just plain awful. The writing, thesis and "evidence" are all horrible. I won't even go into the second two, but check out this gem from page 4: "Another contender was Six Apart, founded in 2002 by then twenty-four-year-olds Ben and Mena Trott in 2004." Or this one from page 208 "Peter's two protoges were going to become closer allies or rivals". Allies? Rivals? Maybe both! Include Lacy's obnoxious habits of name dropping people and super exclusive parties she attended, referring to Mark Zuckerburg constantly as "Zuck" and finishing paragraphs with sentence fragments and you end up with a really painful book to read. " Some other reviews marked useful go like "nauseating in parts, informative in others", "Could have been more", and "Too much Zuck and Ning, got boring after a while". Chapter 7 is all about converting social capital into financial capital. "If financial capital can be summarized as "money" and social capital can be summarized as "friends," then cultural capital can be summarized as "influence."" "The runaway success of Obama's Internet campaign rests primarily on three key factors, first among them a significantly larger financial investment in the online arena than those of his opponents. ... The second key factor in the campaign's success was its lack of direct, in-your-face sales approaches. Clicking on an Obama banner ad led users not to a donation page, but rather to a form where they could sign up for campaign event invitations. Only after submitting the form were visitors asked to make a donation. By avoiding outright sales tactics, Obama confirmed his sincerity and sent supporters a clear, though unspoken, message: Allegiance is more important than money. The third factor of Obama's campaign, and the one that would take his message from a core group of ardently devoted followers and straight into the general public, lay in his advisors' deep understanding of the online world." "More importantly, Lee was following one of the unspoken rules of the Internet: Information is worth more when it's free. In a world where cross-referencing multiple resources is as easy as performing an Internet search, people are less and less willing to pay for information, no matter how specialized or difficult to obtain it is." This is a blanket statement on the monetary value of information, one that is made as an unsubstantiated assertion, based on perhaps the success of Wikipedia, but not one backed by any kind of empirical evidence. We all "know" that information is free, but here's the catch. We cannot, by definition, know the value of priced information unless and until we have access to it, can we now? And we certainly do not know know, or know enough, about such valuable and priced repositories of information like the IEEE or ACM libraries. Even most HBR content, including case studies and articles from the magazine, is behind a priced firewall. Ok, so this book won't give you anything substantial or authoritative on web 2.0, but it's better than some of the garbage out there. At under two hours, the investment it requires is a trifle. You could read it while waiting at the gate to board your flight, and be done with it midway through your flight. You may argue the time could be better spent finger-flicking through emails on your iPhone, but come on. Since when did emails become that important, unless they are about pay hikes? And pay hikes sure ain't coming by in this economy, right? Read the book, go on, pick it up, read it, be done with it, and keep reading on. I would recommend these two other books; if I come across more that are worthwhile I will add to the list. Of course there are likely to be lots more that are readable, but I don't know about those... I read Web 2.0: A Strategy Guide: by Amy Shuen (see my review here), and while I pretty much skewered the book, in retrospect I would say you **should** read the book, in addition to the other books you read on Web 2.0. It is quite a disappointing book, especially when you realize that Amy Shuen, the author, has collaborated on several papers with David Teece, who is probably best known for his 1986 paper, Profiting from Technological Innovation (link to Google Books). Her book, however, fails to convey the technical astuteness she should possess in abundance. Feb 25 2009: corrected typos. Thanks to MB for pointing those out.